Your college or university success depends on getting your insight and research across in a clear and concise way. I provide academic copy editing and proofreading to help your ideas shine through. You can expect beautifully edited and proofread work that highlights your key points, explains your approach, and strengthens your arguments and theories. I’ll copy edit your essay, paper, thesis, dissertation, personal statement, or other work. I can help you structure your academic writing so it flows naturally, will provide editing to get your points and ideas across, and offer suggestions on how to strengthen your work so you get the results you want. Naturally, I’ll also proofread your writing for grammar, spelling, word use, and punctuation to make sure it’s free from errors. Please note that I only edit or proofread work that you have originally created. I do not write academic work, conduct original research, or otherwise add to your content. Any ideas, research, or insights in your work must come from you, and your work must adhere to the rules and guidelines of your academic institution. You need help getting your studies, key points, ideas, insights, or research across in the best possible way. You are applying to a college or university and need your personal statement edited or proofread. You’ve finished your academic paper, thesis, or dissertation and want to make sure it’s perfect. You’re submitting work for a qualification, certification, or other important goal. You want to sharpen your essay, make sure it’s focused, and remove duplication and ambiguity. You have a reference list, bibliography, or other supporting information that needs to be edited. You need advice and editorial guidance to strengthen your academic work. Your first language isn’t English and you need an editor who works with ESL or EFL students. I edit and proofread all types, lengths, formats, and styles of academic work including essays, dissertations, theses, personal statements, reports, studies, manuscripts, and other academic papers. If it’s not on this list, ask me. 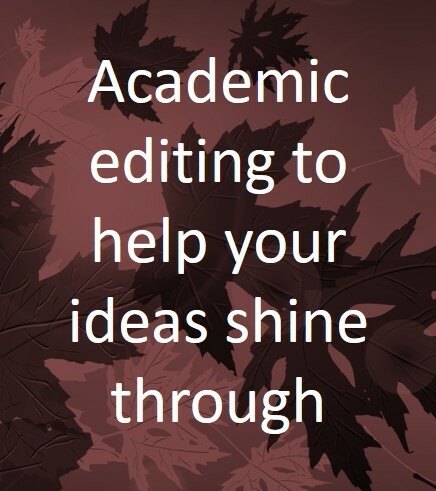 Every student wants their work to succeed, but sometimes you need a professional academic editor to transform your words into something powerful. I copy edit and proofread from the viewpoint of your reader, lecturer, or supervisor, and polish your work so it highlights your original insights, writing, and research. I specialize in academic editing because your ideas should have the chance to shine, even if you find the writing process challenging. I make sure the whole academic proofreading and editing experience is fast, simple, and stress-free for you. I read through your academic paper so I get an overview, then go through your writing line by line. I strengthen the language and edit your academic work to bring out the most important points. I make comments and suggestions to clarify your meaning or to get a deeper understanding of your ideas. I read, review, and check the formatting of your reference list or bibliography. Finally, I complete a second read of the entire piece to make sure it’s error free. I track all of the edits I make so you can see exactly what I’ve changed. With over 20 years of experience as a professional proofreader and editor, I know how important it is to provide academic editing and proofreading you can rely on. I have a fast, friendly, and reliable approach — that means means clear, open communication, always meeting deadlines, high-quality, personalized editing, and providing advice and support throughout. Here's a selection of non-fiction writing and content that I edit and proofread. I’ve answered some of the more common questions about my academic editing and proofreading services below. If your question isn’t covered, please get in touch and I’d be happy to help. What experience do you have as an editor? I have a degree and postgraduate qualifications in journalism and copy editing, and have been editing for over 20 years. In my career I’ve been a managing editor of several scientific and academic peer-reviewed journals, an editorial director, and since 2006, a full-time, freelance copy editor and proofreader. I have a wide range of expertise across multiple subjects and I proofread and edit hundreds of pieces of academic work every year. I’ve shared more details on my background and experience. What expertise do you have in academic copy editing and proofreading? I copy edit and proofread all types of academic content. I’ve given examples for some of the work I edit above and you can find testimonials on my services here. I’m also happy to provide further information on academic proofreading and copy editing, contact me here. How long does it take you to copy edit, proofread, and return academic work? It depends on the length of the paper, thesis, essay, or dissertation, and how busy I am with other proofreading or editing. I normally aim to return academic work within five to seven working days, although if you need it back more quickly please let me know and we’ll agree on a deadline. Will you write or create academic work for me? No, I only edit original academic work that you have created. In all instances it should be your ideas, research, and insights that inform your writing, and my job is to strengthen the work you have already written. I consider essay writing services to be unethical so I have strict guidelines about the level of assistance I will provide. I polish your language and writing, and help you to clarify your academic work and reduce ambiguity or duplication. I do not provide any original writing, research, or insights. I won’t paraphrase other articles for use in papers, theses, or dissertations. Do you check is what I am saying in my academic work is accurate and correct? I do not check the validity or veracity of information, instructions, statements, facts, or conclusions reached in your work, research, methodology, approach, or claims. I will highlight inconsistencies and errors that I find, but this will be on a “best endeavors” basis, and not guaranteed. You should check your statements, ideas, claims, and conclusions with your mentor, professor, or teacher. Do you check for plagiarism or copying? No, I do not check your work for plagiarism or copying. I assume that the work you send to me is original and written by you. There are many plagiarism detection tools available online. Will you proofread and copy edit my reference list, bibliography, or supporting information? Yes, I check the format and consistency of your reference list or bibliography and will edit to correct format and consistency if needed. Do you check if my references are accurate or support my work? No, while I will check the format and consistency of your references, I won’t read through referenced articles and documents to check their validity in supporting your work. Do you guarantee a specific mark or qualification as a result of using your services? No, I cannot guarantee any particular mark, qualification, certification, or score as a result of using my services. I offer practical, focused advice and suggestions to help you strengthen your academic paper. I read through your content as your ideal reader would, and edit your writing to get your points across. If there’s a specific area that I think could be strengthened by you rewriting, clarifying, or otherwise changing your work, I will provide suggestions for improvement. Learn more about how I provide editing advice. How do I know if I need academic copy editing or proofreading? All of my prices include both academic copy editing and proofreading, so I’ll always edit your work so it’s perfect for your audience, including a complete proofread to make sure it’s error free. Are your academic editing and proofreading quotes fully inclusive? All quotes and prices include copy editing and proofreading for a specific number of words. The price includes communicating with you, receiving the work, reading, reviewing, and understanding the content, carrying out two reads, complete editing and proofreading, comments, advice, support, and aftercare. If there ever needs to be a change to the pricing, I would contact you and agree any changes before carrying out any work, but that’s very rare. Yes, I edit with sensitivity to make sure it's your thoughts, ideas, and research that are coming through. I also ensure your writing is clear, concise, and easy to understand. I edit for flow and comprehension, so you get your point across in the most effective way. It still sounds like you wrote it, only more precise. Can you edit to a style or reference guide? Can you provide editing and proofreading assistance if English is not my first language? Yes, I specialize in helping our ESL and EFL students. The majority of the academic editing work that I do is for students who do not have English as a first language. Please note that there is a small, extra charge for editing and proofreading if English is not your first language. Details are on the pricing page.